Bike riding is quite a common recreational activity in Mexico, as well as being many people’s chosen means of transport to work. In recent years, an increasing number of cities have started regular bike festivals or other events. The Festival de Bicicleta in Xalapa, the state capital of Vercaruz, is just one example. Back in 1972, in Mexico City, famous Belgian cyclist Eddy Merckx, considered by many to be the greatest cyclist in the history of the sport, smashed the world one-hour distance record by pedaling 49.431 km (30.715 miles). He simultaneously established new 10 km (6.2 miles) and 20 km records by covering 10 km in 11 minutes 53.2 secs and 20 km in 24 minutes 6.8 secs. One curiosity of this achievement is that contemporary ads for Windsor bikes purport to claim that he was riding a Windsor bike when he smashed the record, whereas he was actually riding an Italian bike! Merckx’s distance record stood for more than a decade before being broken, also in Mexico City, by Francesco Moser. Mexico City is catching up with the craze for bike riding, too. It sees bikes as one way to reduce air pollution. About 30 km ( miles) of downtown streets, including the 8-lane Avenida Reforma, are closed to powered vehicles on Sunday mornings, to provide unhindered access for pedal bikes, walkers, and wheelchairs. Earlier this year, the city began a bike rental system, Ecobici. More than 1,000 bikes were distributed between 85 specially-designed bike stations, spaced around the city center. Users purchase swipe cards which allow them to access a bike. After the trip, the bikes can be returned to any of the stations. City officials anticipate 24,000 riders using the system by the end of the year. 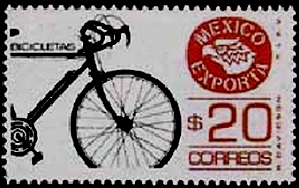 As the postage stamp suggests, Mexico exports bikes, mainly to the USA. The export market has declined, however, in the past decade as several manufacturers who used to assemble bikes in Mexico have moved their operations to China. Firms which have relocated their operations away from Mexico include Huffy (formerly in Nuevo Laredo), Windzy (Monterrey), Brunswick (Ojinaga) and SRAM. The website of the National Association of Bicycle Manufacturers claims that its 14 member companies produce about 3 million bikes a year and employ, between them, 4,000 workers. Q. Is there any pattern to the distribution of bike manufacturers in Mexico? Try plotting the locations mentioned on a map of Mexico to see if any pattern emerges. Q. What factors do you think bicycle manufacturers must take into account when deciding where to locate? Mexico’s manufacturing industry is discussed in chapter 16 of Geo-Mexico: the geography and dynamics of modern Mexico. Mexico’s transportation system is discussed in chapter 17, and its exports in chapter 20. Eddy Merckx isn’t Dutch, he’s Belgian. Thanks for spotting that, nationality has now been corrected. The windsor factory in 1972 was owned by Itallians who raced in the old country, and designed and built the Windsor bikes. Pretty much makes them Italian bikes, doesnit it? I an Italian bike on the wooden velodrome in Mexico D.F. and was made an honorary member of the Mexican Cycling Acadamey. I was State Rep of the ABLA in Texas at the time. On a Sunday I went to Chapultapec Park and talked a Mexican Olympic rider into letting me use his bike for a few fast laps of the park. These were little guys and I was 6″ tall with long legs. Must’ve really looked funny wiring fast on a little bike with my knees almost up to my ears. I was there leading a University of Dallas MBA team on a study of the Mexican Business System. Contracting with Windsor to do a marketing reaearch study in Texas in exchange for a top-line Windsor Racing bike. Did my study in a couple of weeks. Am still waiting for my Windsor. Guess it isn’t coming!